Wednesday: Duck report—with THREE videos! All is well with the ducks despite yesterday’s trauma. 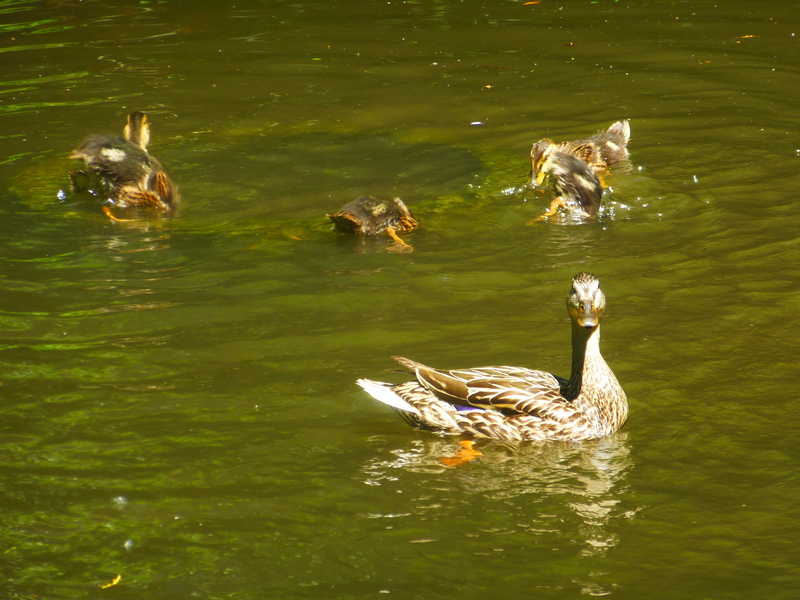 I had a mini-trauma today: I went to the pond and there were FOUR DRAKES swimming about: Henry, Hank, and two new interlopers. Honey spent a long time chasing them around, and I worry that this wears her out. 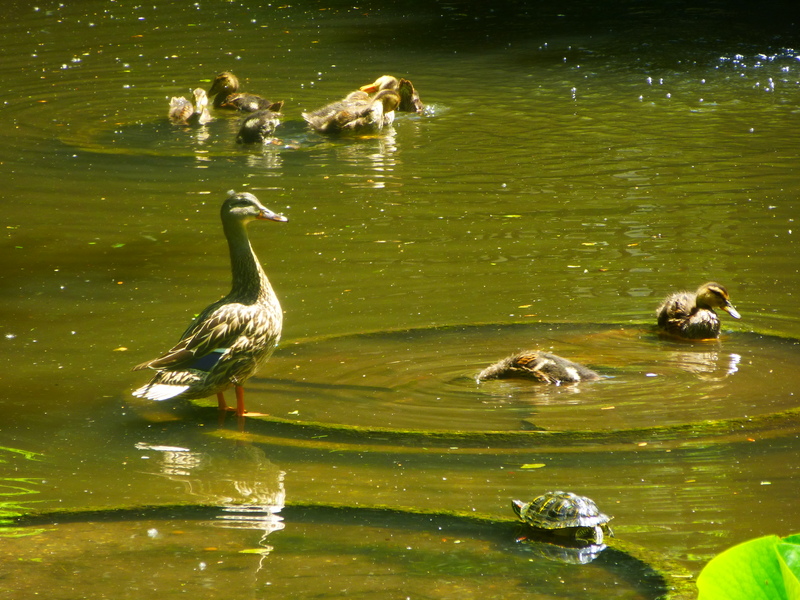 The ducklings stayed on the island and wouldn’t venture into the water, as they got chased by the males. But I brought out my trusty Super Soaker and drove the drakes away with some well-aimed squirts of water. They haven’t yet returned. I present some pictures but we have three videos. 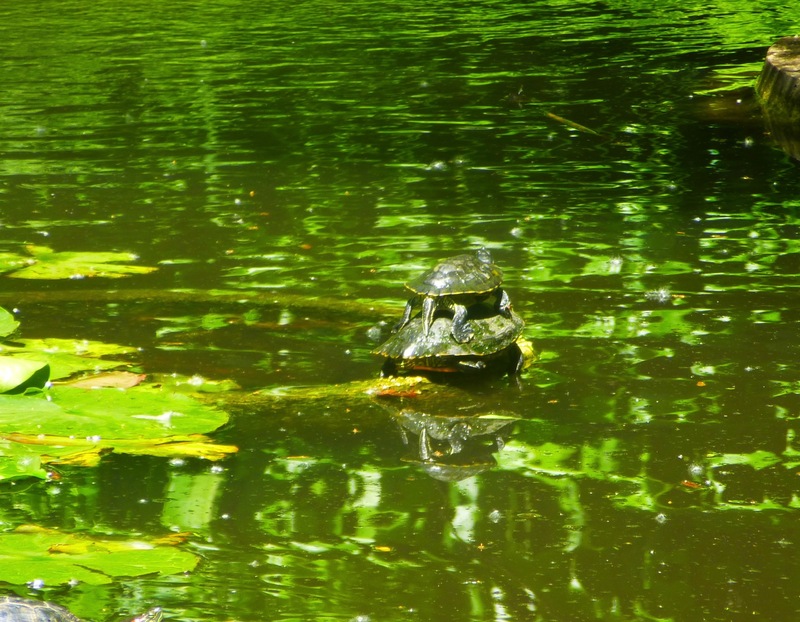 Be sure to watch them, as they’re short and show a lot of the behavior we see at the pond. It gets frenetic out there. 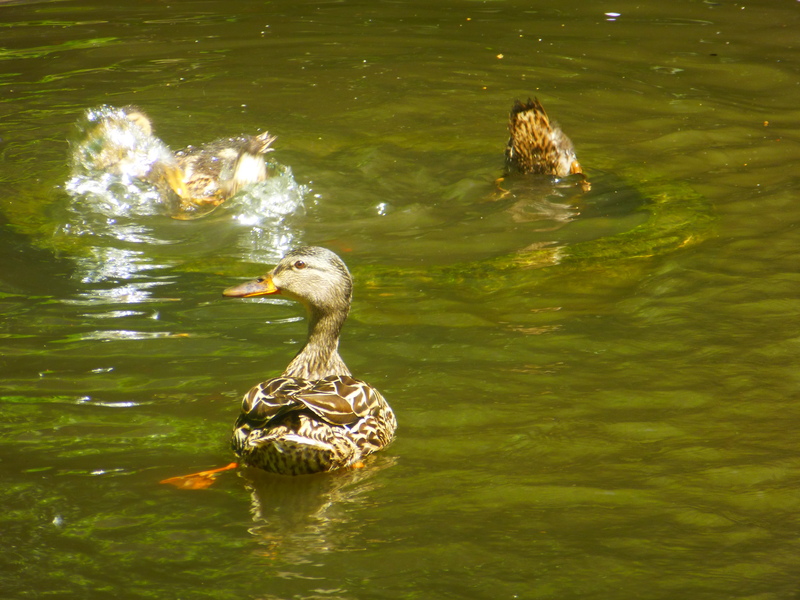 Sometimes the ducklings just take off swimming as fast as they can for no apparent reason. And they can swim fast! This video was taken by Anna just a few minutes ago. 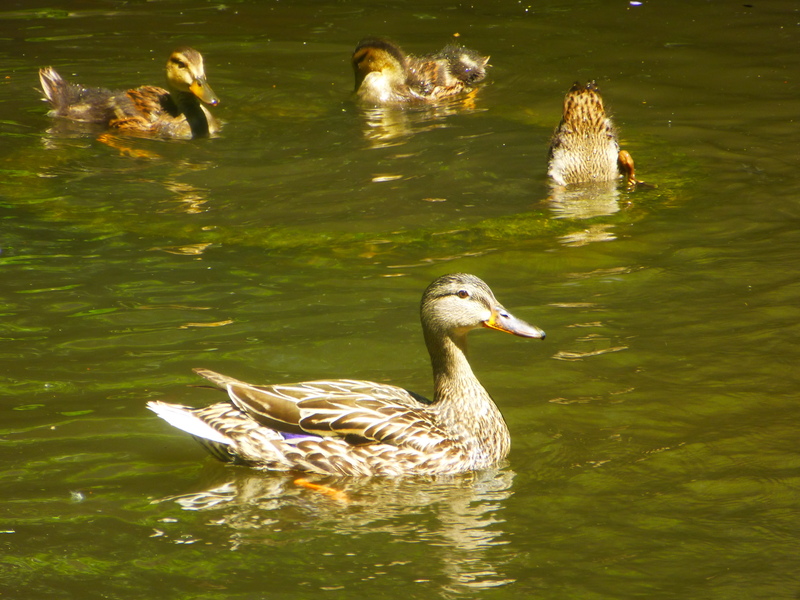 She is convinced (note video title) that the ducklings had a quantum leap in growth yesterday, so to her they appear much larger than they did yesterday. I’m dubious, but they are getting big! This shows bathtime after today’s feeding, and you can see why we love these ducklings so. Watch them dabble, pop underwater and resurface, and flap their little stubs of wings. It’s a delightful show, and they do it after every meal. Do watch this with the screen BIG. This video was taken by Mr. Bill Dimitroff two days ago. He comes down here occasionally from Montreal and always checks on (and films) the ducks. Honey, the brood, and Frank are foraging in the grass, eating some corn we put down, and you can see Frank taking out after the ducklings. Like all mallards, a chase is preceded by a “head down” display. Fortunately, Frank never pecks or hurts the babies; he just wants their food. Anna took this video of Frank yesterday. He was being sequestered in the small pond and fed copious noms so he’d stay away from the other pond, where I was feeding Honey and the brood. This entry was written by whyevolutionistrue and posted on June 13, 2018 at 3:00 pm and filed under ducklings, ducks. Bookmark the permalink. Follow any comments here with the RSS feed for this post. Both comments and trackbacks are currently closed. The human’s mate guarding behavior is adorable. 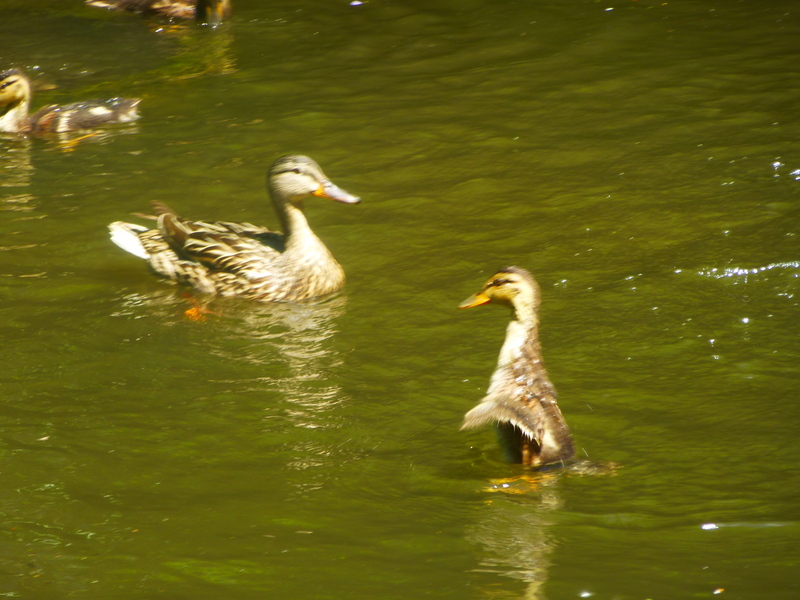 When will the ducklings fledge – end of June, beginning of July? I think when they’re about as big as Honey, they’ll fledge. Haven’t been keeping track of their age, but at about 50 to 60 days they’ll fledge. I’m worried about those other drakes, that they might have chased Honey away yesterday. I’ve read that post-breeding is very stressful for the hens, especially when they don’t get enough to eat while protecting their broods. The male Mallards have a higher survival rate, hence we tend to see more of them at this time. We’re trying to ensure that Honey gets enough to eat, but she really doesn’t eat much when watching her brood eats. I worry a lot about that, but don’t know what to do. You’re doing the best you can, Jerry, and indeed over and above the call of duty. I hope that, when her babies fledge, she’ll be more inclined to eat what she requires and will enjoy a little well-earned freedom! They ARE noticeably bigger. For sure! And totes adorbs. Indeed they are noticeably larger. I think you should expect yet further interlopers, tho. The word is surely out that there’s a (duck) soup kitchen on campus. Hail Freedonia, te land of the free! Do you use a thesaurus while writing or do those occasional whoppers develop naturally? Anyone know the practicality of keeping Koi in the duck pond? That would be pretty cool. Do koi need additional feed? That would be a hassle to do every day in summer if they do. 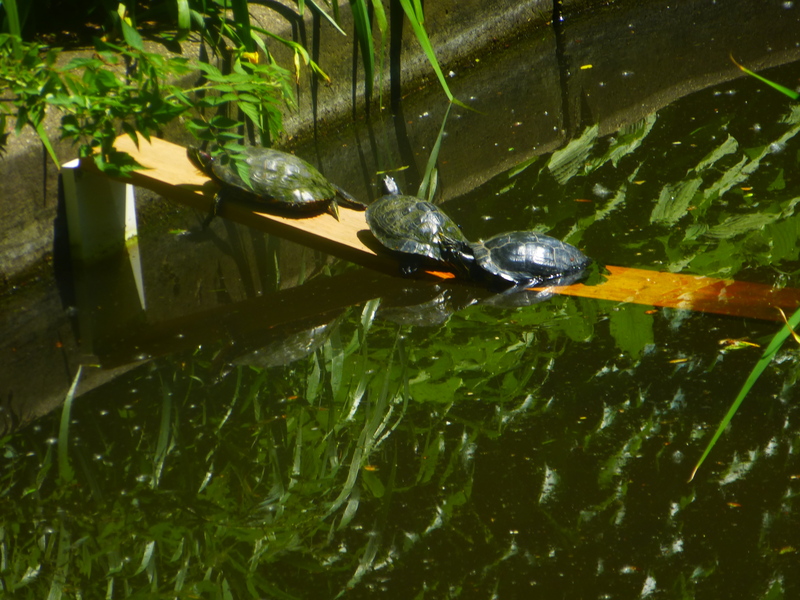 And some turtle species like a fish nibble now & then – though I’ve seen turtles & fish together at my garden centre. If the pond has 6-foot deep spots and a ‘bubbler’ (a pump that keeps the pond from completely freezing over), then koi and common goldfish could overwinter. 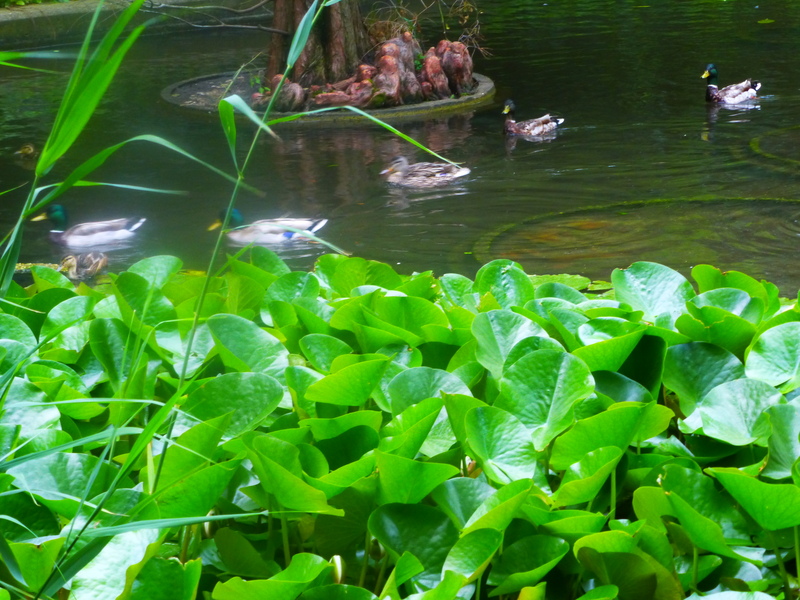 They eat a ton in the hot summer months, so there would have to be extra vegetation in the pond (like self-propagating water hyacinths and duckweed), or someone feeding them pellets, to sustain them. Otherwise they’ll eat up the roots of the water lilies. Big kois have been known to eat small ducklings. I thought there were fish in Botany Pond already. They’d be a draw for herons that’ll go after ducklings too. All the koi seem to have died off over the winter and spring, which is odd, as there were some here after the thaw. 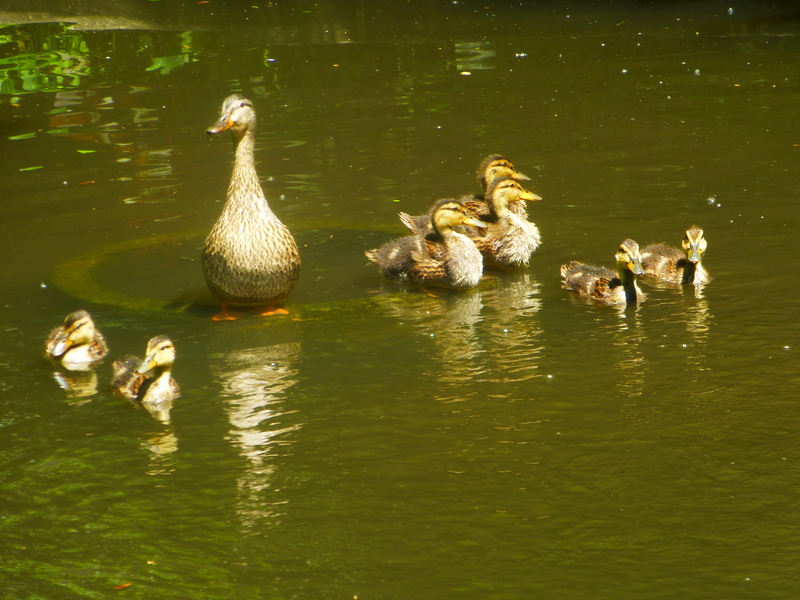 A “coyneUcopia” of ducklings that simultaneously lift your spirit and re-affirm hope in humanity! I am guessing that I was not alone in recently having a sleepless night worrying over Honey? Thanks for allowing us to share this journey. Oh, I, too, was anxious when Honey went missing. And so relieved when she came back. I hope the Super Soaker shows up in the Angry Catman series! One problem I guess of all wild animal feeders is deciding which ones to support! I guess that by how Honey, like the gender studies prof recently discussed here, hates all adult males!